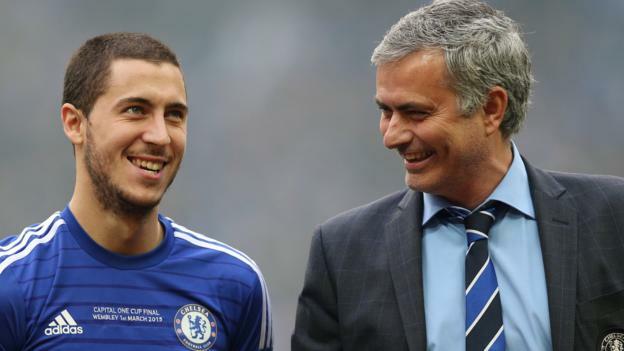 Chelsea forward Eden Hazard says he would like to work with former Blues boss Jose Mourinho again. Belgium international Hazard, 27, has been at Chelsea since 2012 and won the Premier League under Mourinho in 2014-15 and under Antonio Conte in 2016-17. Mourinho now manages Manchester United, whom Chelsea face in their next Premier League match on Saturday, 20 October. “If I’m now asked one coach with whom I want to work again, then I say: ‘Mourinho’,” Hazard told HLN. Hazard played under Mourinho for more than two years and was an integral part of Chelsea’s title win in 2014-15, scoring 14 Premier League goals and being voted the Professional Footballers’ Association Players’ Player of the Year. But Mourinho was sacked in December 2015 with the team 16th in the table, and with Hazard having failed to score in 24 appearances. “In 12 years I’ve only had one bad season – the last six months under Mourinho – and it was partly my fault,” added Hazard. “After the title, we asked Mourinho for extra holidays. I came back totally out of shape. Hazard, the Premier League’s top goalscorer this season with seven goals, has said he may have to move to a Spanish club to have a chance of winning the Ballon d’Or, which is awarded to the best footballer of the year. He has also said it was his dream to play for Real Madrid, but has ruled out a transfer in the January window. Chelsea have won six and drawn two of their eight Premier League games in 2018-19 and are second, behind champions Manchester City on goal difference. Manchester United are eighth, seven points behind.